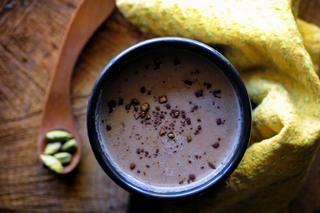 A warm, healthy, tasty, comforting and nourishing take on hot chocolate. Vegan, gluten-free and full of heart-healthy cacao, delicious cardamom, and protein-rich tahini. The perfect winter beverage! I'm just a wee bit obsessed with cacao powder (not to be confused with cocoa powder). . .
Cacao powder is about the healthiest form of chocolate that you can consume. It is the product of ground raw cacao beans -- completely unprocessed unlike the cocoa powder that most of us are familiar with. And, boy is it healthy . . Through many experimental cups, I discovered the amazingly delicious and complementary power of protein-rich tahini and flavorful cardamom paired with amazingly healthy cacao powder. This combo will blow you away, as you sink into delicious and relaxing guilt-free bliss. Enjoy. . . In a sauce pan over medium heat combine all of the above ingredients.Whisk continually until all is smoothly combined, beginning to bubble and appears frothy.Carefully pour into mug(s), and optionally sprinkle with a little cardamom or cinnamon.Enjoy!